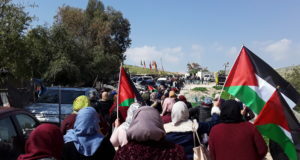 Following a relatively calm demonstration last week, and the unprovoked murder of Aqel Sror on 5 June, demonstrators marched towards the Apartheid fence with apprehension, unsure of what force would meet them. It was eerily quiet as demonstrators managed to reach the wall without the whistle of tear gas flying through the air. The youths, well organized and prepared, were able to cut several sections of the razor wire fence that makes up this section of the ilegal Apartheid Wall. 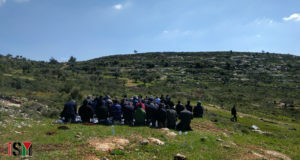 Contrary to the reaction of the Israeli army in all previous demonstrations which is generally disproportionate and excessive, these actions received no immediate reaction from the Israeli army, which permitted the youths to remove approximately 50 meters of the razor wire and damage several metal posts in the fence. After perhaps an hour however, four jeeps began to drive back and forth below the area the youth were, provoking them to throw rocks in a symbolic gesture of refusing to be intimated. After two and a half hours, the Popular Committe declared the end of the action, and all went home.